That turned out to be a little more difficult than it should have been, but a win is a win and I'll take it. And Scott Schoeneweis has been so great this season that I'll forgive him this trespass if he promises never to do it again in a closer game. I have mixed reviews on Pedro's comeback. He started off well, but lost his steam and only lasted 6 innings. I'm willing to concede that maybe he let up a little once he got the big lead. He did throw a lot of pitches but remember, he's recovering from a leg injury, not an arm injury. 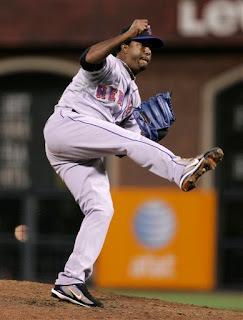 Pedro even got two hits and exhibited some of his trademark enthusiasm which many are convinced will turn the Mets around. 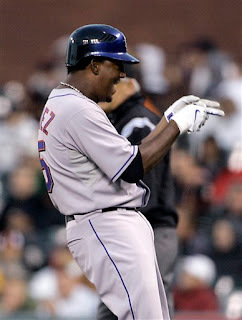 There's not much to say about the Mets 4th inning other than it was awesome and they need to keep it going. The Mets have now won 6 of 8 games, which is great, except they lost 7 of the 8 games before that. Jose Reyes's 18-game hitting streak is over but he set a Mets record by reaching base in his 34th straight game, the most in one season. In general I think Pedro will pitch about 6 innings. But I was hopeful he would pitch more because the bullpen went 8 2/3 the previous night, he had an 8 run lead and he breezed through the first four innings. And if that's all we can expect from Pedro and Maine, and they get even less from Perez and Pelfrey, the bullpen will be fried by September, and we saw how well that worked out last year.